Thermophilic and thermotolerant microorganisms are of important economic value due to their ability to produce thermostable extracellular enzymes which have important biotechnological applications. It is known that thermophilic activities are generally associated with protein thermostability. Thus, proteins produced by thermophiles tend to be more thermostable than their mesophilic counterparts. The mechanisms of intrinsic thermostability of the protein that results in the molecular rigidity are related to a number of hydrogen and disulfide bonds, salt bridges, presence of hydrophobic amino acids and the packing of external residues. The advantage of the use of thermostable enzymes for conducting biotechnological processes at elevated temperatures are: reducing the risk of contamination by mesophilic microorganisms; decreasing the viscosity of the reaction medium; increasing the bioavailability and solubility of organic compounds; increasing the diffusion coefficient of substrates and products resulting in higher reaction rates. Several cellulases, xylanases and pectinases have been applied in biotechnological processes such as biobleaching of paper pulp, production of animal feed, production of fermentable sugars for obtaining biofuel from cellulosic wastes, fruit juice extraction and clarification, refinement of vegetable fibers, degumming of natural fibers, curing of coffee, cocoa and tobacco and also for waste-water treatment. The thermostable enzymes are produced directly from native microorganisms but, in the majority of the industrial processes, the heterologous expression the enzyme is carrying out. Here, we discuss thermophilic microorganisms and their thermostable enzyme involved with plant material degradations and the prokaryotic and eukaryotic systems for heterologous expression of those enzymes. Ahn K-Y, Song J-A, Han K-Y, Park J-S, Seo H-S, Lee J. Heterologous protein expression using a novel stress-responsive protein of E. coli RpoA as fusion expression partner. Enzyme Microb Technol. 2007;41:859–66. http://dx.doi.org/10.1016/j.enzmictec.2007.07.009. Aleksenko A, Clutterbuck AJ. Autonomous plasmid replication in Aspergillus nidulans: AMA1 and MATE elements. Fungal Genet Biol. 1997;21:373–87. http://dx.doi.org/10.1006/fgbi.1997.0980. Alkorta I, Garbisu C, Llama MJ, Serra JL. Industrial applications of pectic enzymes: a review. Process Biochem. 1998;33:21–8. http://dx.doi.org/10.1016/S0032-9592(97)00046-0. Anjana Devi N, Appu Rao AG. Fractionation, purification, and preliminary characterization of polygalacturonases produced by Aspergillus carbonarius. Enzyme Microb Technol. 1996;18:59–65. http://dx.doi.org/10.1016/0141-0229(96)00055-5. Annamalai N, Rajeswari MV, Elayaraja S, Balasubramanian T. Thermostable, haloalkaline cellulase from Bacillus halodurans CAS 1 by conversion of lignocellulosic wastes. Carbohydr Polym. 2013;94:409–15. http://dx.doi.org/10.1016/j.carbpol.2013.01.066. Arifoğlu N, Ögel ZB. Avicel-adsorbable endoglucanase production by the thermophilic fungus Scytalidium thermophilum type culture Torula thermophila. Enzyme Microb Technol. 2000;27:560–9. http://dx.doi.org/10.1016/S0141-0229(00)00241-6. Arthur H, Watson K. Thermal adaptation in yeast: growth temperatures, membrane lipid, and cytochrome composition of psychrophilic, mesophilic, and thermophilic yeasts. J Bacteriol. 1976;128:56–68. http://jb.asm.org/content/128/1/56.abstract. Awram P, Smit J. The Caulobacter crescentus paracrystalline s-layer protein is secreted by an ABC transporter (type I) secretion apparatus. J Bacteriol. 1998;180:3062–9. http://jb.asm.org/content/180/12/3062.abstract. Barense RI, Chellegatti MAdSC, Fonseca MJV, Said S. Partial purification and characterization of exopolygalacturonase II and III of Penicillium frequentans. Braz J Microbiol. 2001;32:327–30. http://www.scielo.br/scielo.php?script=sci_arttext&pid=S1517-83822001000400014&nrm=iso. Barnard GC, Henderson GE, Srinivasan S, Gerngross TU. High level recombinant protein expression in Ralstonia eutropha using T7 RNA polymerase based amplification. Protein Expr Purif. 2004;38:264–71. http://dx.doi.org/10.1016/j.pep.2004.09.001. Ben Mabrouk S, Zouari Ayadi D, Ben Hlima H, Bejar S. Thermostability improvement of maltogenic amylase MAUS149 by error prone PCR. J Biotechnol. 2013;168:601–6. http://dx.doi.org/10.1016/j.jbiotec.2013.08.026. Bhalla A, Bischoff KM, Uppugundla N, Balan V, Sani RK. Novel thermostable endo-xylanase cloned and expressed from bacterium Geobacillus sp. WSUCF1. Bioresour Technol. 2014;165:314–8. http://dx.doi.org/10.1016/j.biortech.2014.03.112. Bok J-D, Yernool DA, Eveleigh DE. Purification, characterization, and molecular analysis of thermostable cellulases CelA and CelB from thermotoga neapolitana. Appl Environ Microbiol. 1998;64:4774–81. http://aem.asm.org/content/64/12/4774.abstract. Brawner ME. 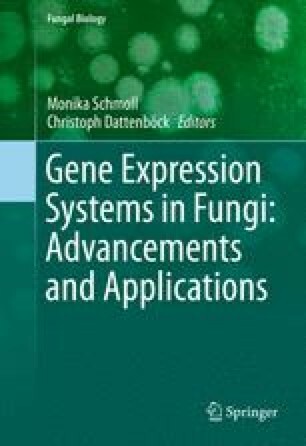 Advances in heterologous gene expression by Streptomyces. Curr Opin Biotechnol. 1994;5:475–81. http://dx.doi.org/10.1016/0958-1669(94)90060-4. Breccia JD, Siñeriz F, Baigorí MD, Castro GR, Hatti-Kaul R. Purification and characterization of a thermostable xylanase from Bacillus amyloliquefaciens. Enzyme Microb Technol. 1998;22:42–9. http://dx.doi.org/10.1016/S0141-0229(97)00102-6. Bronnenmeier K, Kern A, Liebl W, Staudenbauer WL. Purification of Thermotoga maritima enzymes for the degradation of cellulosic materials. Appl Environl Microbiol. 1995;61:1399–407. http://aem.asm.org/content/61/4/1399.abstract. Bundock P, den Dulk-Ras A, Beijersbergen A, Hooykaas PJ. Trans-kingdom T-DNA transfer from Agrobacterium tumefaciens to Saccharomyces cerevisiae. EMBO J. 1995;14:3206–14. http://www.ncbi.nlm.nih.gov/pmc/articles/PMC394382/. Cain JA, Solis N, Cordwell SJ. Beyond gene expression: the impact of protein post-translational modifications in bacteria. J Proteomics. 2014;97:265–86. http://dx.doi.org/10.1016/j.jprot.2013.08.012. Castro AMD, Pereira Jr N. Produção, propriedades e aplicação de celulases na hidrólise de resíduos agroindustriais. Quím Nova. 2010;33:181–8. http://www.scielo.br/scielo.php?script=sci_arttext&pid=S0100-40422010000100031&nrm=iso. Chellegatti MADSC, Fonseca MJV, Said S. Purification and partial characterization of exopolygalacturonase I from Penicillium frequentans. Microbiol Res. 2002;157:19–24. http://dx.doi.org/10.1078/0944-5013-00127. Collins T, Gerday C, Feller G. Xylanases, xylanase families and extremophilic xylanases. FEMS Microbiol Rev. 2005;29:3–23. http://dx.doi.org/ 10.1016/j.femsre.2004.06.005. Damásio ARDL, Silva TM, Almeida FBDR, Squina FM, Ribeiro DA, Leme AFP, Segato F, Prade RA, Jorge JA, Terenzi HF, Polizeli MDLTM. Heterologous expression of an Aspergillus niveus xylanase GH11 in Aspergillus nidulans and its characterization and application. Process Biochem. 2011;46:1236–42. http://dx.doi.org/10.1016/j.procbio.2011.01.027. Damez C, Bouquillon S, Harakat D, Hénin F, Muzart J, Pezron I, Komunjer L. Alkenyl and alkenoyl amphiphilic derivatives of d-xylose and their surfactant properties. Carbohydr Res. 2007;342:154–62. http://dx.doi.org/10.1016/j.carres.2006.11.013. de Marco A, De Marco V. Bacteria co-transformed with recombinant proteins and chaperones cloned in independent plasmids are suitable for expression tuning. J Biotechnol. 2004;109:45–52. http://dx.doi.org/10.1016/j.jbiotec.2003.10.025. Delabona PDS, Cota J, Hoffmam ZB, Paixão DAA, Farinas CS, Cairo JPLF, Lima DJ, Squina FM, Ruller R, Pradella JGDC. Understanding the cellulolytic system of Trichoderma harzianum P49P11 and enhancing saccharification of pretreated sugarcane bagasse by supplementation with pectinase and α-l-arabinofuranosidase. Bioresour Technol. 2013;131:500–7. http://dx.doi.org/10.1016/j.biortech.2012.12.105. Demain AL, Vaishnav P. Production of recombinant proteins by microbes and higher organisms. Biotechnol Adv. 2009;27:297–306. http://dx.doi.org/10.1016/j.biotechadv.2009.01.008. Desplancq D, Bernard C, Sibler A-P, Kieffer B, Miguet L, Potier N, Van Dorsselaer A, Weiss E. Combining inducible protein overexpression with NMR-grade triple isotope labeling in the cyanobacterium Anabaena sp. PCC 7120. Biotechniques. 2005;39:405–11. http://europepmc.org/abstract/MED/16206912. Deutschmann R, Dekker RFH. From plant biomass to bio-based chemicals: latest developments in xylan research. Biotechnol Adv. 2012;30:1627–40. http://dx.doi.org/10.1016/j.biotechadv.2012.07.001. Dey TB, Adak S, Bhattacharya P, Banerjee R. Purification of polygalacturonase from Aspergillus awamori Nakazawa MTCC 6652 and its application in apple juice clarification. LWT Food Sci Technol. 2014;59:591–5. http://dx.doi.org/10.1016/j.lwt.2014.04.064. Dias MOS, Junqueira TL, Cavalett O, Cunha MP, Jesus CDF, Rossell CEV, Maciel Filho R, Bonomi A. Integrated versus stand-alone second generation ethanol production from sugarcane bagasse and trash. Bioresour Technol. 2012;103:152–61. http://dx.doi.org/10.1016/j.biortech.2011.09.120. Dominguez R, Souchon H, Spinelli S, Dauter Z, Wilson KS, Chauvaux S, Beguin P, Alzari PM. A common protein fold and similar active site in two distinct families of [beta]-glycanases. Nat Struct Mol Biol. 1995;2:569–76. http://dx.doi.org/10.1038/nsb0795-569. Fan G, Yang S, Yan Q, Guo Y, Li Y, Jiang Z. Characterization of a highly thermostable glycoside hydrolase family 10 xylanase from Malbranchea cinnamomea. Int J Biol Macromol. 2014;70:482–9. http://dx.doi.org/10.1016/j.ijbiomac.2014.07.025. Fenel F, Leisola M, Jänis J, Turunen O. A de novo designed N-terminal disulphide bridge stabilizes the Trichoderma reesei endo-1,4-β-xylanase II. J Biotechnol. 2004;108:137–43. http://dx.doi.org/10.1016/j.jbiotec.2003.11.002. Fushinobu S, Alves VD, Coutinho PM. Multiple rewards from a treasure trove of novel glycoside hydrolase and polysaccharide lyase structures: new folds, mechanistic details, and evolutionary relationships. Curr Opin Struct Biol. 2013;23:652–9. http://dx.doi.org/10.1016/j.sbi.2013.06.001. Gao M, Shi Z. Process control and optimization for heterologous protein production by methylotrophic Pichia pastoris. Chin J Chem Eng. 2013;21:216–26. http://dx.doi.org/10.1016/S1004-9541(13)60461-9. Gao M-T, Yano S, Minowa T. Characteristics of enzymes from Acremonium cellulolyticus strains and their utilization in the saccharification of potato pulp. Biochem Eng J. 2014;83:1–7. http://dx.doi.org/10.1016/j.bej.2013.11.017. Garg G, Dhiman SS, Gautam R, Mahajan R, Patra AK, Sharma J. Bioscouring of jute fabric by cellulase-free alkalo-thermostable xylanase from Bacillus pumilus ASH. J Mol Catal B Enzym. 2013;85–86:43–8. http://dx.doi.org/10.1016/j.molcatb.2012.08.002. Gellissen G, Hollenberg CP. Application of yeasts in gene expression studies: a comparison of Saccharomyces cerevisiae, Hansenula polymorpha and Kluyveromyces lactis—a review. Gene. 1997;190:87–97. http://dx.doi.org/10.1016/S0378-1119(97)00020-6. Gems D, Johnstone IL, Clutterbuck AJ. An autonomously replicating plasmid transforms Aspergillus nidulans at high frequency. Gene. 1991;98:61–7. http://dx.doi.org/10.1016/0378-1119(91)90104-J. Georgiou G, Segatori L. Preparative expression of secreted proteins in bacteria: status report and future prospects. Curr Opin Biotechnol. 2005;16:538–45. http://dx.doi.org/10.1016/j.copbio.2005.07.008. Georis J, Giannotta F, De Buyl E, Granier Bt, Frère J-M. Purification and properties of three endo-β-1,4-xylanases produced by Streptomyces sp. strain S38 which differ in their ability to enhance the bleaching of kraft pulps. Enzyme Microb Technol. 2000;26:178–86. http://dx.doi.org/10.1016/S0141-0229(99)00141-6. Goodey AR. The production of heterologous plasma proteins. Trends Biotechnol. 1993;11:430–3. http://dx.doi.org/10.1016/0167-7799(93)90007-V.
Graham JE, Clark ME, Nadler DC, Huffer S, Chokhawala HA, Rowland SE, Blanch HW, Clark DS, Robb FT. Identification and characterization of a multidomain hyperthermophilic cellulase from an archaeal enrichment. Nat Commun. 2011;2:375. http://www.nature.com/ncomms/journal/v2/n7/suppinfo/ncomms1373_S1.html. Gutiérrez A, López-García S, Garre V. High reliability transformation of the basal fungus Mucor circinelloides by electroporation. J Microbiol Methods. 2011;84:442–6. http://dx.doi.org/10.1016/j.mimet.2011.01.002. Haki GD, Rakshit SK. Developments in industrially important thermostable enzymes: a review. Bioresour Technol. 2003;89:17–34. http://dx.doi.org/10.1016/S0960-8524(03)00033-6. Hedlund BP, Cole JK, Williams AJ, Hou W, Zhou E, Li W, Dong H. A review of the microbiology of the Rehai geothermal field in Tengchong, Yunnan Province, China. Geosci Front. 2012;3:273–88. http://dx.doi.org/10.1016/j.gsf.2011.12.006. Henrissat A, Bairoch BA. Updating the sequence-based classification of glycosyl hydrolases. Biochem J. 1996;316:695–6. http://www.biochemj.org/bj/316/bj3160695.htm. Henrissat B, Callebaut I, Fabrega S, Lehn P, Mornon JP, Davies G. Conserved catalytic machinery and the prediction of a common fold for several families of glycosyl hydrolases. Proc Natl Acad Sci. 1995;92:7090–4. http://www.pnas.org/content/92/15/7090.abstract. Horn S, Vaaje-Kolstad G, Westereng B, Eijsink VG. Novel enzymes for the degradation of cellulose. Biotechnol Biofuels. 2012;5:45. http://www.biotechnologyforbiofuels.com/content/5/1/45. Hung K-S, Liu S-M, Tzou W-S, Lin F-P, Pan C-L, Fang T-Y, Sun K-H, Tang S-J. Characterization of a novel GH10 thermostable, halophilic xylanase from the marine bacterium Thermoanaerobacterium saccharolyticum NTOU1. Process Biochem. 2011;46:1257–63. http://dx.doi.org/10.1016/j.procbio.2011.02.009. Ibrahim D, Weloosamy H, Sheh-Hong L. Potential use of nylon scouring pad cubes attachment method for pectinase production by Aspergillus niger HFD5A-1. Process Biochem. 2014;49:660–7. http://dx.doi.org/10.1016/j.procbio.2014.01.012. Ilmen M, den Haan R, Brevnova E, McBride J, Wiswall E, Froehlich A, Koivula A, Voutilainen S, Siika-aho M, la Grange D, Thorngren N, Ahlgren S, Mellon M, Deleault K, Rajgarhia V, van Zyl W, Penttila M. High level secretion of cellobiohydrolases by Saccharomyces cerevisiae. Biotechnol Biofuels. 2011;4:30. http://www.biotechnologyforbiofuels.com/content/4/1/30. Jayani RS, Saxena S, Gupta R. Microbial pectinolytic enzymes: a review. Process Biochem. 2005;40:2931–44. http://dx.doi.org/10.1016/j.procbio.2005.03.026. Jiang Z, Li X, Yang S, Li L, Tan S. Improvement of the breadmaking quality of wheat flour by the hyperthermophilic xylanase B from Thermotoga maritima. Food Res Int. 2005;38:37–43. http://dx.doi.org/10.1016/j.foodres.2004.07.007. Kalogeris E, Christakopoulos P, Kekos D, Macris BJ. Studies on the solid-state production of thermostable endoxylanases from Thermoascus aurantiacus: characterization of two isozymes. J Biotechnol. 1998;60:155–63. http://dx.doi.org/10.1016/S0168-1656(97)00186-7. Kapoor M, Khalil Beg Q, Bhushan B, Dadhich KS, Hoondal GS. Production and partial purification and characterization of a thermo-alkali stable polygalacturonase from Bacillus sp. MG-cp-2. Process Biochem. 2000;36:467–73. http://dx.doi.org/10.1016/S0032-9592(00)00238-7. Kashyap DR, Vohra PK, Chopra S, Tewari R. Applications of pectinases in the commercial sector: a review. Bioresour Technol. 2001;77:215–27. http://dx.doi.org/10.1016/S0960-8524(00)00118-8. Katzke N, Arvani S, Bergmann R, Circolone F, Markert A, Svensson V, Jaeger K-E, Heck A, Drepper T. A novel T7 RNA polymerase dependent expression system for high-level protein production in the phototrophic bacterium Rhodobacter capsulatus. Protein Expr Purif. 2010;69:137–46. http://dx.doi.org/10.1016/j.pep.2009.08.008. Keränen S, Penttilä M. Production of recombinant proteins in the filamentous fungus Trichoderma reesei. Curr Opin Biotechnol. 1995;6:534–7. http://dx.doi.org/10.1016/0958-1669(95)80088-3. Kim TH, Kim TH. Overview of technical barriers and implementation of cellulosic ethanol in the U.S. Energy. 2014;66:13–9. http://dx.doi.org/10.1016/j.energy.2013.08.008. Klein TM, Wolf ED, Wu R, Sanford JC. High-velocity microprojectiles for delivering nucleic acids into living cells. Nature. 1987;327:70–3. http://dx.doi.org/10.1038/327070a0. Kobayashi T, Hatada Y, Higaki N, Lusterio DD, Ozawa T, Koike K, Kawai S, Ito S. Enzymatic properties and deduced amino acid sequence of a high-alkaline pectate lyase from an alkaliphilic Bacillus isolate. Biochim Biophys Acta Gen Subjects. 1999;1427:145–54. http://dx.doi.org/10.1016/S0304-4165(99)00017-3. Kohli U, Nigam P, Singh D, Chaudhary K. Thermostable, alkalophilic and cellulase free xylanase production by Thermoactinomyces thalophilus subgroup C. Enzyme Microb Technol. 2001;10:606–10. http://dx.doi.org/10.1016/S0141-0229(01)00320-9. Lee J-W, Park J-Y, Kwon M, Choi I-G. Purification and characterization of a thermostable xylanase from the brown-rot fungus Laetiporus sulphureus. J Biosci Bioeng. 2009;107:33–7. http://dx.doi.org/10.1016/j.jbiosc.2008.09.006. Leite RSR, Gomes E, da Silva R. Characterization and comparison of thermostability of purified β-glucosidases from a mesophilic Aureobasidium pullulans and a thermophilic Thermoascus aurantiacus. Process Biochem. 2007;42:1101–6. http://dx.doi.org/10.1016/j.procbio.2007.05.003. Leite RSR, Alves-Prado HF, Cabral H, Pagnocca FC, Gomes E, Da-Silva R. Production and characteristics comparison of crude β-glucosidases produced by microorganisms Thermoascus aurantiacus e Aureobasidium pullulans in agricultural wastes. Enzyme Microb Technol. 2008;43:391–5. http://dx.doi.org/10.1016/j.enzmictec.2008.07.006. Martins EdS, Silva D, Da Silva R, Gomes E. Solid state production of thermostable pectinases from thermophilic Thermoascus aurantiacus. Process Biochem. 2002;37:949–54. http://dx.doi.org/10.1016/S0032-9592(01)00300-4. McHunu NP, Singh S, Permaul K. Expression of an alkalo-tolerant fungal xylanase enhanced by directed evolution in Pichia pastoris and Escherichia coli. J Biotechnol. 2009;141:26–30. http://dx.doi.org/10.1016/j.jbiotec.2009.02.021. Mei Y, Chen Y, Zhai R, Liu Y. Cloning, purification and biochemical properties of a thermostable pectinase from Bacillus halodurans M29. J Mol Catal B Enzym. 2013;94:77–81. http://dx.doi.org/10.1016/j.molcatb.2013.05.004. Mitrovic A, Flicker K, Steinkellner G, Gruber K, Reisinger C, Schirrmacher G, Camattari A, Glieder A. Thermostability improvement of endoglucanase Cel7B from Hypocrea pseudokoningii. J Mol Catal B Enzym. 2014;103:16–23. http://dx.doi.org/10.1016/j.molcatb.2013.12.009. Moretti MMDS, Bocchini-Martins DA, Nunes CDCC, Villena MA, Perrone OM, Silva Rd, Boscolo M, Gomes E. Pretreatment of sugarcane bagasse with microwaves irradiation and its effects on the structure and on enzymatic hydrolysis. Appl Energy. 2014;122:189–95. http://dx.doi.org/10.1016/j.apenergy.2014.02.020. NC-IUBMB. Nomenclature Committee of the International Union of Biochemistry and Molecular Biology. Eur J Biochem. 1999;264:610–50. doi: 10.1046/j.1432-1327.1999.nomen.x. Novagen. pET System manual. In: Merck KGaA, editor. 2003. http://download.bioon.com.cn/upload/month_1003/20100314_04f17ef5ae569f1ce0a6rq5Yepyoh4S4.attach.pdf. Olofsson K, Bertilsson M, Liden G. A short review on SSF—an interesting process option for ethanol production from lignocellulosic feedstocks. Biotechnol Biofuels. 2008;1:7. http://www.biotechnologyforbiofuels.com/content/1/1/7. Parachin NS, Siqueira S, de Faria FP, Torres FAG, de Moraes LMP. Xylanases from Cryptococcus flavus isolate I-11: enzymatic profile, isolation and heterologous expression of CfXYN1 in Saccharomyces cerevisiae. J Mol Catal B Enzym. 2009;59:52–7. http://dx.doi.org/10.1016/j.molcatb.2008.12.018. Parisot J, Langlois V, Sakanyan V, Rabiller C. Cloning expression and characterization of a thermostable exopolygalacturonase from Thermotoga maritima. Carbohydr Res. 2003;338:1333–7. http://dx.doi.org/10.1016/S0008-6215(03)00165-4. Petsch D, Anspach FB. Endotoxin removal from protein solutions. J Biotechnol. 2000;76:97–119. http://dx.doi.org/10.1016/S0168-1656(99)00185-6. Phillips TA, VanBogelen RA, Neidhardt FC. lon gene product of Escherichia coli is a heat-shock protein. J Bacteriol. 1984;159:283–7. http://jb.asm.org/content/159/1/283.abstract. Potvin G, Ahmad A, Zhang Z. Bioprocess engineering aspects of heterologous protein production in Pichia pastoris: a review. Biochem Eng. J. 2012;64:91–105. http://dx.doi.org/10.1016/j.bej.2010.07.017. Pribowo A, Arantes V, Saddler JN. The adsorption and enzyme activity profiles of specific Trichoderma reesei cellulase/xylanase components when hydrolyzing steam pretreated corn stover. Enzyme Microb Technol. 2012;50:195–203. http://dx.doi.org/10.1016/j.enzmictec.2011.12.004. Puchart Vr, Katapodis P, Biely P, Kremnický Lr, Christakopoulos P, Vršanská M, Kekos D, Macris BJ, Bhat MK. Production of xylanases, mannanases, and pectinases by the thermophilic fungus Thermomyces lanuginosus. Enzyme Microb Technol. 1999;24:355–61. http://dx.doi.org/10.1016/S0141-0229(98)00132-X. Qiao W, Tang S, Mi S, Jia X, Peng X, Han Y. Biochemical characterization of a novel thermostable GH11 xylanase with CBM6 domain from Caldicellulosiruptor kronotskyensis. J Mol Catal B Enzym. 2014;107:8–16. http://dx.doi.org/10.1016/j.molcatb.2014.05.009. Qing G, Ma L-C, Khorchid A, Swapna GVT, Mal TK, Takayama MM, Xia B, Phadtare S, Ke H, Acton T, Montelione GT, Ikura M, Inouye M. Cold-shock induced high-yield protein production in Escherichia coli. Nat Biotechnol. 2004;22:877–82. http://www.nature.com/nbt/journal/v22/n7/suppinfo/nbt984_S1.html. Radzio R, Kück U. Synthesis of biotechnologically relevant heterologous proteins in filamentous fungi. Process Biochem. 1997;32:529–39. http://dx.doi.org/10.1016/S0032-9592(97)00004-6. Rani DS, Nand K. Production of thermostable cellulase-free xylanase by Clostridium absonum CFR-702. Process Biochem. 2000;36:355–62. http://dx.doi.org/10.1016/S0032-9592(00)00224-7. Rastogi G, Bhalla A, Adhikari A, Bischoff KM, Hughes SR, Christopher LP, Sani RK. Characterization of thermostable cellulases produced by Bacillus and Geobacillus strains. Bioresour Technol. 2010;101:8798–806. http://dx.doi.org/10.1016/j.biortech.2010.06.001. Rehman HU, Aman A, Nawaz MA, Qader SAU. Characterization of pectin degrading polygalacturonase produced by Bacillus licheniformis KIBGE-IB21. Food Hydrocolloids. 2015;43:819–24. http://dx.doi.org/10.1016/j.foodhyd.2014.08.018. Rustiguel CB, Terenzi HF, Jorge JA, Guimarães LHS. A novel silver-activated extracellular β-d-fructofuranosidase from Aspergillus phoenicis. J Mol Catal B Enzym. 2010;67:10–5. http://dx.doi.org/10.1016/j.molcatb.2010.06.012. Ruttersmith L, Daniel R. Thermostable cellobiohydrolase from the thermophilic eubacterium Thermotoga sp. strain FjSS3-B.1. Purification and properties. Biochem J. 1991;277:887–90. http://www.biochemj.org/bj/277/bj2770887.htm. Saha BC. Production, purification and properties of xylanase from a newly isolated Fusarium proliferatum. Process Biochem. 2002;37:1279–84. http://dx.doi.org/10.1016/S0032-9592(02)00012-2. Sahnoun M, Bejar S, Sayari A, Triki MA, Kriaa M, Kammoun R. Production, purification and characterization of two α-amylase isoforms from a newly isolated Aspergillus Oryzae strain S2. Process Biochem. 2012;47:18–25. http://dx.doi.org/10.1016/j.procbio.2011.09.016. Saul DJ, Williams LC, Reeves RA, Bergquist PL. Secondary structure model for an unusual SSU rRNA from the extremely thermophilic bacterium strain AZ3 B.1. Biochim Biophys Acta Gene Struct Expr. 1994;1217:211–3. http://dx.doi.org/10.1016/0167-4781(94)90038-8. Scandurra R, Consalvi V, Chiaraluce R, Politi L, Engel PC. Protein thermostability in extremophiles. Biochimie. 1998;80:933–41. http://dx.doi.org/10.1016/S0300-9084(00)88890-2. Schuster A, Bruno K, Collett J, Baker S, Seiboth B, Kubicek C, Schmoll M. A versatile toolkit for high throughput functional genomics with Trichoderma reesei. Biotechnol Biofuels. 2012;5:1. http://www.biotechnologyforbiofuels.com/content/5/1/1. Shallom D, Shoham Y. Microbial hemicellulases. Curr Opin Microbiol. 2003;6:219–28. http://dx.doi.org/10.1016/S1369-5274(03)00056-0. Sharma DC, Satyanarayana T. A marked enhancement in the production of a highly alkaline and thermostable pectinase by Bacillus pumilus dcsr1 in submerged fermentation by using statistical methods. Bioresour Technol. 2006;97:727–33. http://dx.doi.org/10.1016/j.biortech.2005.04.012. Singhania RR, Sukumaran RK, Patel AK, Larroche C, Pandey A. Advancement and comparative profiles in the production technologies using solid-state and submerged fermentation for microbial cellulases. Enzyme Microb Technol. 2010;46:541–9. http://dx.doi.org/10.1016/j.enzmictec.2010.03.010. Song J-A, Lee D-S, Park J-S, Han K-Y, Lee J. A novel Escherichia coli solubility enhancer protein for fusion expression of aggregation-prone heterologous proteins. Enzyme Microb Technol. 2011;49:124–30. http://dx.doi.org/10.1016/j.enzmictec.2011.04.013. Stephens DE, Khan FI, Singh P, Bisetty K, Singh S, Permaul K. Creation of thermostable and alkaline stable xylanase variants by DNA shuffling. J Biotechnol. 2014;187:139–46. http://dx.doi.org/10.1016/j.jbiotec.2014.07.446. Szijártó N, Siika-aho M, Tenkanen M, Alapuranen M, Vehmaanperä J, Réczey K, Viikari L.Hydrolysis of amorphous and crystalline cellulose by heterologously produced cellulases of Melanocarpus albomyces. J Biotechnol. 2008;136:140–7. http://dx.doi.org/10.1016/j.jbiotec.2008.05.010. Szilágyi A, Závodszky P. Structural differences between mesophilic, moderately thermophilic and extremely thermophilic protein subunits: results of a comprehensive survey. Structure. 2000;8:493–504. http://dx.doi.org/10.1016/S0969-2126(00)00133-7. Teng C, Yan Q, Jiang Z, Fan G, Shi B. Production of xylooligosaccharides from the steam explosion liquor of corncobs coupled with enzymatic hydrolysis using a thermostable xylanase. Bioresour Technol. 2010;101:7679–82. http://dx.doi.org/10.1016/j.biortech.2010.05.004. Trevizano LM, Ventorim RZ, de Rezende ST, Silva Junior FP, Guimarães VM. Thermostability improvement of Orpinomyces sp. xylanase by directed evolution. J Mol Catal B Enzym. 2012;81:12–18. http://dx.doi.org/10.1016/j.molcatb.2012.04.021. Turner P, Mamo G, Karlsson E. Potential and utilization of thermophiles and thermostable enzymes in biorefining. Microbial Cell Factories. 2007;6:9. http://www.microbialcellfactories.com/content/6/1/9. Van Hung P, Maeda T, Morita N. Waxy and high-amylose wheat starches and flours—characteristics, functionality and application. Trends Food Sci Technol. 2006;17:448–56. http://dx.doi.org/10.1016/j.tifs.2005.12.006. Vassileva A, Chugh DA, Swaminathan S, Khanna N. Expression of hepatitis B surface antigen in the methylotrophic yeast Pichia pastoris using the GAP promoter. J Biotechnol. 2001;88:21–35. http://dx.doi.org/10.1016/S0168-1656(01)00254-1. Wang B, Xia L. High efficient expression of cellobiase gene from Aspergillus niger in the cells of Trichoderma reesei. Bioresour Technol. 2011;102:4568–72. http://dx.doi.org/10.1016/j.biortech.2010.12.099. Wang Y, Wang X, Tang R, Yu S, Zheng B, Feng Y. A novel thermostable cellulase from Fervidobacterium nodosum. J Mol Catal B Enzym. 2010;66:294–301. http://dx.doi.org/10.1016/j.molcatb.2010.06.006. Wang H-C, Chen Y-C, Huang C-T, Hseu R-S. Cloning and characterization of a thermostable and pH-stable cellobiohydrolase from Neocallimastix patriciarum J11. Protein Expr Purif. 2013;90:153–9. http://dx.doi.org/10.1016/j.pep.2013.06.004. Waterham HR, Digan ME, Koutz PJ, Lair SV, Cregg JM. Isolation of the Pichia pastoris glyceraldehyde-3-phosphate dehydrogenase gene and regulation and use of its promoter. Gene. 1997;186:37–44. http://dx.doi.org/10.1016/S0378-1119(96)00675-0. Willats WGT, Knox JP, Mikkelsen JD. Pectin: new insights into an old polymer are starting to gel. Trends Food Sci. Technol. 2006;17:97–104. http://dx.doi.org/10.1016/j.tifs.2005.10.008. Winterhalter C, Liebl W. Two extremely thermostable xylanases of the hyperthermophilic bacterium Thermotoga maritima MSB8. Appl Environ Microbiol. 1995;61:1810–5. http://aem.asm.org/content/61/5/1810.abstract. Zhang H, Woodams EE, Hang YD. Influence of pectinase treatment on fruit spirits from apple mash, juice and pomace. Process Biochem. 2011;186:1909–13. http://dx.doi.org/10.1016/j.procbio.2011.06.020. Zhang F, Hu S-N, Chen J-J, Lin L-B, Wei Y-L, Tang S-K, Xu L-H, Li W-J. Purification and partial characterisation of a thermostable xylanase from salt-tolerant Thermobifida halotolerans YIM 90462 T. Process Biochemi. 2012;47:225–8. http://dx.doi.org/10.1016/j.procbio.2011.10.032. Zhang Q, Zhang W, Lin C, Xu X, Shen Z. Expression of an Acidothermus cellulolyticus endoglucanase in transgenic rice seeds. Protein Expr Purif. 2012;82:279–83. http://dx.doi.org/10.1016/j.pep.2012.01.011. Zoglowek M, Lübeck PS, Ahring BK, Lübeck M. Heterologous expression of cellobiohydrolases in filamentous fungi—an update on the current challenges, achievements and perspectives. Process Biochem. 2015;50:211–20. http://dx.doi.org/10.1016/j.procbio.2014.12.018.